Last month, Pinterest made a departure from their “personal, non-commercial use” only policy and announced new updates for businesses using the site, including the ability to verify their websites and identities. The new accounts don’t look very different from the old personal accounts, but it’s clear from this move that Pinterest will be rolling out additional features for businesses in the near future – good news from the website that now refers more retail purchases than Facebook despite its significantly smaller user audience. According to a BlogHer study, 47 percent of U.S. consumers alone have purchased something they found or were recommended on Pinterest, and the site has grown by 23.4 million unique visitors from October 2011 to the same point in 2012. Our Trend Alert: Pinterest for Brands article from May can give you more background on the Do’s and Don’ts and examples for beginner users, but if you already have an account for your company, it’s worthwhile to update it to a business version since you will have access to resources and tools as Pinterest continues to develop them. The first step is to go to the new Pinterest for Business resource page, and follow the instructions to convert your account. You’ll be prompted to identify your business type, name, contact email and other basic information. You’ll also have the option to verify your business website address by adding some HTML verification code to your site. Similar to verifying your site with Google Webmaster Tools, this step confirms to Pinterest that the site you’re verifying belongs to you and that someone is not fraudulently representing you. This step can be a bit trickier, so if you need more assistance check out this detailed e-book guide from HubSpot that walks you through the process. An example of one of the resources on Pinterest’s new ‘for brands” page. Once you’ve transitioned the account, the Pinterest for Brands page now offers multiple case studies – including a travel company called Jetsetter – on how to maximize the sites for brands. There are also sections to help walk you through embedding your Pinterest content on external sites and how to incorporate that content on your own sites including sections on adding widgets and buttons, and providing logos and trademarks for you to use. Also check out the promotions and marketing guide, and the “What Works” section is going to illustrate different ways you can use the site to highlight your content and products. 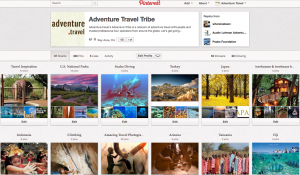 AdventureTravelNews feature that describes Pinterest and the statistics around its relevance for brands, as well as giving basic tips on using the site. Those tips are re-posted at the bottom of this piece as well. What follows here are in-depth suggestions for using Pinterest strategically to promote and build your brand as part of an overall social media outreach plan. 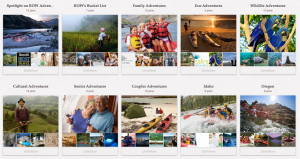 Create product boards on specific tours, types of trips, or travel activities. 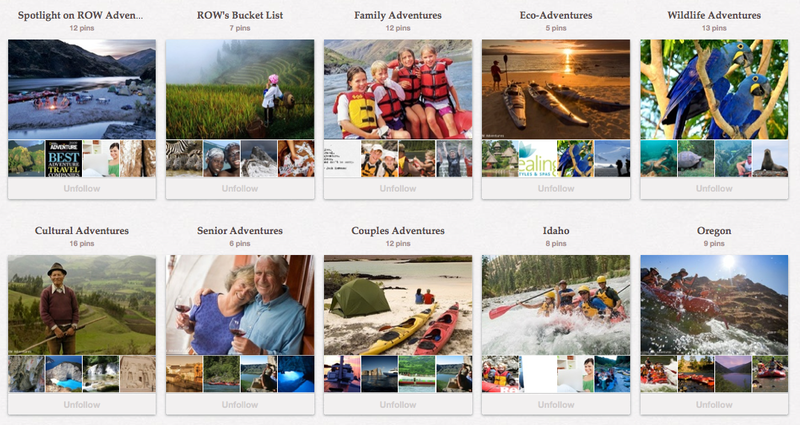 Posting a higher number of boards with very specific themes will give you more reach and elicit more interest and excitement than general “travel” themed boards with tons of loosely related image themes. 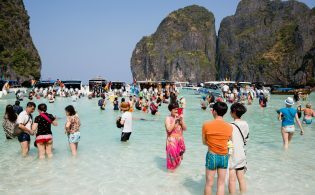 So instead of creating a board of “Our Morocco Tour,” try adding multiple boards around “Moroccan street food,” “Moroccan architecture,” “Off the Beaten Path in Morocco” – think of expansive themes that may catch the eye of different types of travelers and build libraries that convey the richness of the trip or destination. 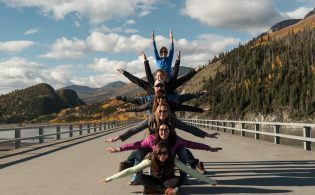 organizes images by the types of ways people might be thinking about traveling – who (family groups, couples, seniors, etc), what (eco-adventures, wildlife trips, cycling trips, and so on) or where (different trip locations). If you really want to crank up the investment, insert web addresses and even price tags directly onto the images so people can trace them back to you. Infographics can help you turn expertise and reputation into share-able visuals. 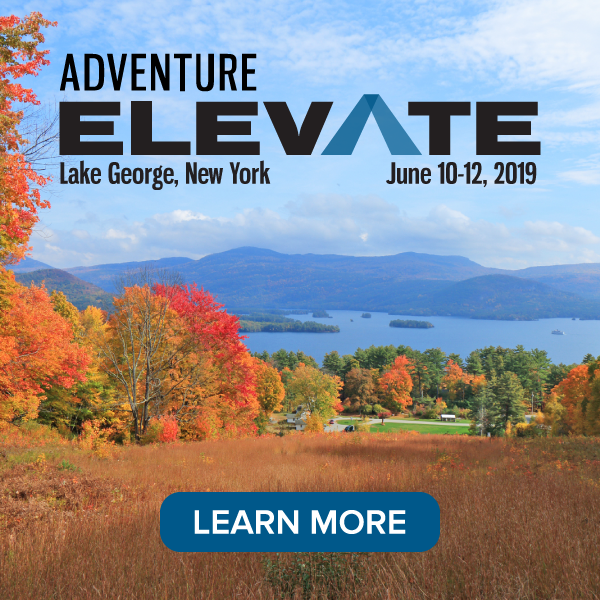 why travel agents should use Pinterest, Dori Saltzman encourages savvy agents to become content curators, and build their reputations as expert travel resources by grouping together more than pretty images. rich visuals as Pinterest grows in popularity. Unlike other social networking sites, Pinterest is a completely public forum – anyone can follow you, you see who is following you, and everyone’s interactions and posts are completely open. The beauty of this for brands is that you can glean unique insights into both demographics and psychometrics of your both your target consumers and your followers. Millions of people use Pinterest to keep track of objects they love, places they enjoy, foods they devour and things that inspire them… Look at the pinners who follow your brand — see what they’re pinning and who else they’re following. They’re volunteering a lot of information about their interests, passions, dreams and sense of humor in a more natural way on Pinterest than they would on say, a survey or even on Facebook, where they have to manually enter “sarcasm” or “travel” as an interest. 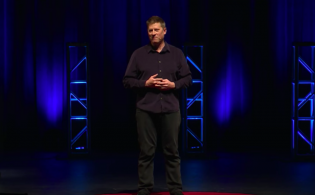 A useful way to do this might be to see if the people following your boards are not your target demographic – does this mean you have an untapped market you’re not going after? Or perhaps your brand message is off kilter to your targets? Follow other brands’ boards that seem to be capturing your key target consumers and analyze what messaging and values they’re employing successfully. Pinterest is one more channel in your tool box for making yourself available to people across multiple touchpoints. Content is king in the new age of advertising, but keeping it fresh across all your sites can be difficult and time consuming, especially for smaller businesses. Saltzman points out that Pinterest is a great place for sourcing plenty of fantastic content quickly and by theme, which can then be passed along through your social networks and blogs in a pinch (with proper attribution, of course). 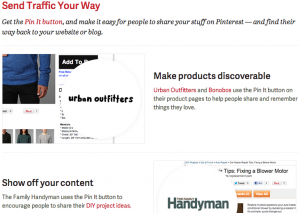 …and draw your Pinterest content out on your other networks. If you’re going to start using Pinterest, be sure to add value to your other, more established online efforts by bringing your pinned content through to your other sites. Add a “Follow us on Pinterest” option to your website and Facebook, and occasionally share images from your Pinterest across your other social networking platforms. recent Techcrunch article points out that this cross-platform use of Pinterest can multiply the site’s effectiveness for reach, but that there are specific mobile optimization concerns for things like Facebook tabs. Twitter, Pinterest is not a place to consistently dump your content and wait for people to come to you. The key to social networking remains being social – engage in the people around you, not just to learn about them and their interactions to your content, but to succeed at getting more eyes on your brand. 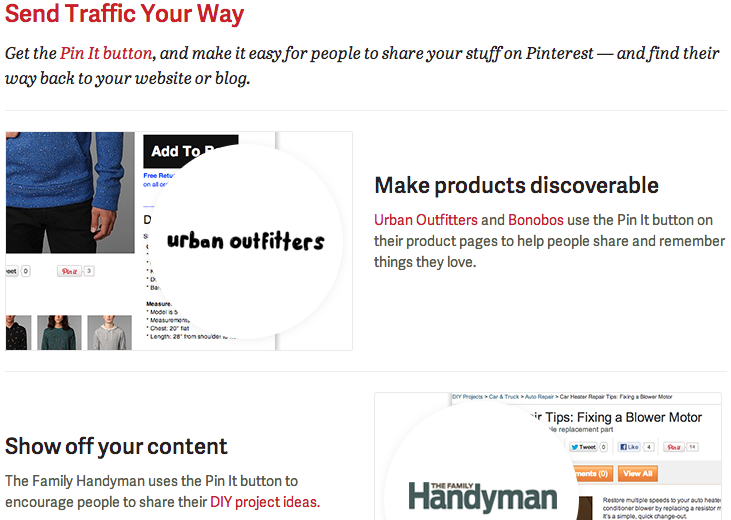 Be a good neighbor and repin and “like” images from other users and comment on their pins. Ask questions. Respond to people who comment on yours. Search for topics in your domain and become part of (or better yet, start) conversations around them. What other ways are you using Pinterest to promote and support your brand? I’d love to hear from you! 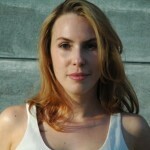 Pin high quality, visually stimulating images – that is after all, the point! Elicit interaction – advertise your Pinterest across your other sites once it has some good material on it; interact in the Pinterest community; leave some of your boards open so others can contribute photos to them and invite them to do so. business case studies and more. Follow the ATTA on Pinterest. Great overview, Nicole. As always! FWIW, I also use hidden pinboards to organize content for future projects. Pin boards are also an easy way to share images within a team, as you brainstorm visual elements for new ad campaigns, logos, product lines, or anything that’s easier to show than to describe. 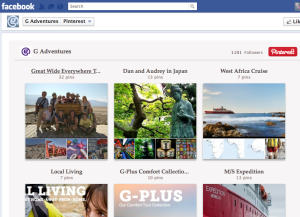 If other adventure travel folks are on Pinterest, I’m http://pinterest.com/michaelmccoll/ .